Would you like to develop and improve your Arabic Language (Speaking, Writing, Reading and Understanding easily)? * Developing the ability to study at the university. * Developing the ability to do higher education studies (M.A, PhD and researchers) easily, you would be able to prepare a strong thesis and complete it correctly. * Developing the ability to conduct Scientific Researches using the Arabic Language. * Developing the ability to write articles or reports in various magazines: printed or electronic ones. * Developing the ability to work in local Arab or international organizations which offer services to the Arab audience. * Developing the ability to communicate and serve the Arab customers in international companies. * Developing the ability to make commercial, scientific, social, or political presentations using the Arabic Language. * Developing and improving the Arabic Language for people who want to study the media language and communications for the knowledge and acquiring social experiences. You will be able to express, write and comment professionally in Arabic easily. * Developing the Arabic Language for social relations especially for couples and children. * Developing the Arabic language for the High School Students, and other grades stages. Arabic is the language of 22 of the Member States of UNESCO and is one of the Organization’s official languages. It is one of the most widespread languages spoken by more than 422 million people, most of whom live in the Middle East and North Africa. Arabic became a UN official working language on 18 December 1973 by virtue of a United Nations General Assembly resolution. In an effort to support and strengthen linguistic and cultural diversity within the UN system, on 19 February 2010 the United Nations Department of Public Information announced the decision to celebrate an international day for each of the six official languages of the UN: French (March 20), English (April 23), Russian (June 6), Spanish (October 12), Chinese (November 13) and Arabic (December 18). Arabic Language Day is celebrated on 18 December, the date on which the UN General Assembly designated Arabic as the sixth official language of the United Nations. The Arabic Language has the largest number of words in contrast with other languages. It has 12,300,000 words without repeating. While the English language has only 600,000 words according to the biggest English lexicon. This means that the Arabic words are more than 20 times of the English words. 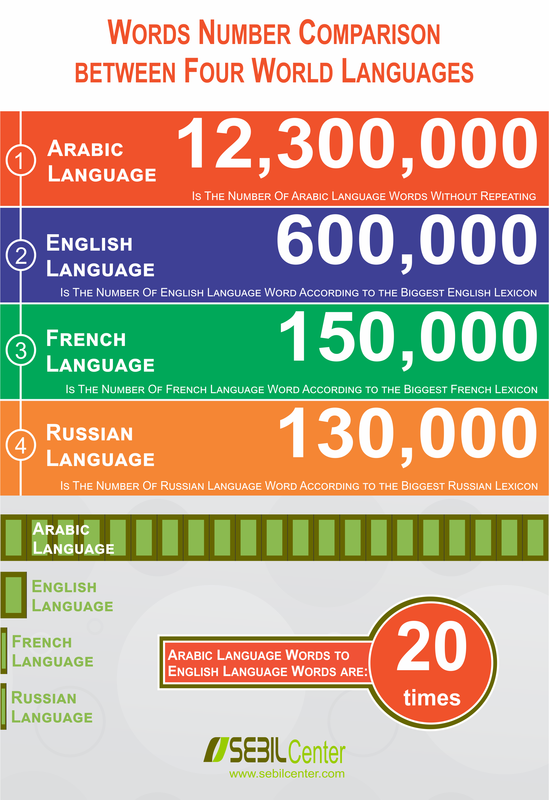 On the other hand, the French language has 150,000 words, and the Russian language has 130,000 words according to the biggest language lexicons. This can lead to this question: Is Arabic language the mother of all languages? Arabic is one member of the Semitic family of languages, which itself is a branch of the Afro-Asiatic superfamily. The earliest evidence of proto-Arabic or Old North Arabian, the earlier language that was the ancestor of classical Arabic, dates back to around 1000BCE, about the same time as the emergence of Aramaic and Ge-ez which are also Semitic. Arabic has a complete organized structure of roots, that is to say, the roots meet fully all the needs of human beings in the field of expression; the other languages are not so fitted. In Arabic, the names of the Divine Being, the names of the principal constituent parts of the universe, of plants, animals and minerals and of the members of the human body, possess, in the why and wherefore of their contents, deep philosophy and learning. The Additions and the roots of Arabic words are perfectly organized. interrelationships. This is not to be found, to this degree of excellence, in other languages. In Arabic expressions, words are few but meanings are many, that is to say, the Arabic language makes use of (ا) [alif], and (ل) [laam] and nunnation (تنوین) and the sequence of words, in such a way that to express the same meaning the other languages need a number of sentences to be linked up for the same purpose. Arabic possesses roots and expressions which are the perfect means of portraying the most delicate and deep things of the mind and human ideas. The secret of the letter "X"
Terry Moore gives the surprising answer. Listen and watch to discover the whole story!